As you can see from the photos, this moth is tiny. The letters "a" and "r" are about 1.7mm. 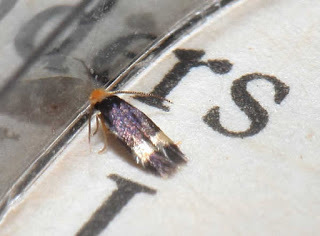 From the written descriptions that I have, there are two Stigmella species that fit the description of this moth. 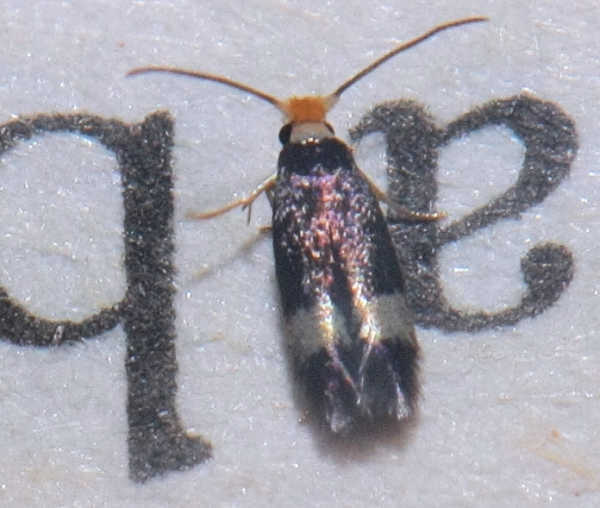 Many of the moths in this family have a lighter wing colour and the band across the fore wing is yellow, where this moth has darker wings and a shiny white band. The moths of the family NEPTICULIDAE generally have a wing span of 3 to 6mm. The larvae appear the be found on a wide variety if plants. The moths of this family are also common in many other parts of the world.